The current Samsung Exynos 5 Octa processor was announced to much fanfare at CES 2013 due to the sheer number of cores it has (eight, as the Octa moniker suggests). The sensational processing power of the chipset looks incredible on paper, but the only device powered by the octa-core processors – the Samsung Galaxy S4 – was beset with performance issues, primarily with battery life. Perhaps for this reason, the Korean giants have announced that a refreshed edition of the Exynos 5 Octa chipset will be unveiled next week. Technical information is not yet available for the time being, but they should be disclosed alongside more information regarding the GPU when it is officially announced next week. 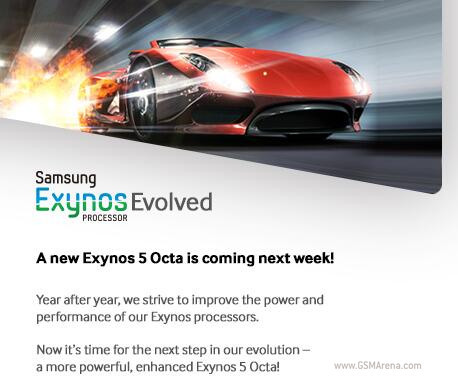 As it stands, the refreshed Exynos 5 Octa chip looks to be ready to be launched in time to be fitted into the new Galaxy Note III phablet. Rumours are already circulating that, just like the Galaxy S4, Samsung will release two initial variants of the Galaxy Note III – one with its own Exynos chipset and another with the premium Qualcomm Snapdragon 800 quad-core processor.